If you’re an entrepreneurial dietitian, you probably have a website. 1. Your website represents your business. In this scenario, you run a business, probably a private practice, and the purpose of your website is to inform potential customers about your services, and give them an easy way to contact you for 1:1 appointments. Your focus here is on clear messaging & branding, connecting with your ideal client, and driving them to book an appointment. 2. Your website is a blog. In this scenario, your focus is less on booking 1:1 appointments, and more on providing informational value to your ideal client, with the hopes of building large enough traffic to produce an icome from your website. Your focus here is on posting quality content on a consistent basis, spreading it effectively on social media, and building a base of repeat-readers who will keep your traffic numbers high. These two scenarios definitely aren’t mutually exclusive. Many RDs do a combination of both, with an “About Me”, “Work With Me”, and “Contact Me” page for their business, in addition to a routinely updated blog page. The goal for combination websites is usually less about driving traffic to the site, and more about building a connection with your ideal client and becoming a trusted resource within your niche, so that you are top of mind when potential clients are ready to work with a dietitian. Are ads appropriate for all types of sites? 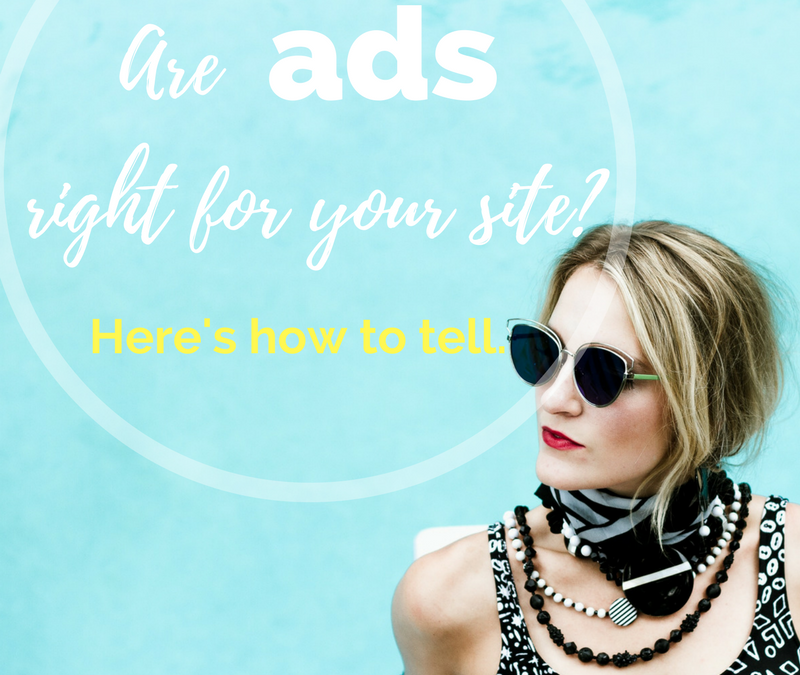 The answer here is really personal, but I think in general, ads are more popular on blogging websites than professional sites. I think this has a lot to do with the expectation of the reader when they arrive on your site. When a reader goes to your website to consume free content, such as a blog post, they understand that the ads placed on your site are one way you, as the author, are compensated for your work. Nobody expects you to work for free (okay, maybe some people do), but in general, non-intrusive ads are well accepted on blogs. Here, the expectation of the reader is to find out more information about your business, in order to decide whether or not to work with you and pay you money. In this case, an abundance of ads may give your website the appearance of being “cheap” or “unprofessional”, or worse, a site intended to click-bait people in order to make advertising income. If you plan to ONLY use your website as a place to advertise your private practice, ads may not be worth the hassle. Without regularly updated content to drive visitors to your site, you’ll only have enough traffic to earn pennies through ads each month. This is probably not worth the hassle, so I recommend instead focusing your efforts on converting visitors into paying customers. When should i place ads on my site? Many dietitians create a website or blog without much thought about advertising. In fact, I blogged for over a year without putting one ad on my site. That’s because in the beginning, blogging should be about everything but money. 1. You won’t know if you like blogging until you try it. Why waste time setting up your “perfect” website, and populating it with ads, if 6 months from now you realize that blogging isn’t really your thing? You’re better off giving blogging a trial run for at least a few months to see how you like it, before spending a significant amount of time on website development & ads. 2. You need quality content to be eligible for ad networks. Even the most basic ad networks, like Google Adsense, will require at least SOME content on your site. If you apply to their network the first day you launch your blog, with just 1 post, you’ll likely be denied. This is because Google wants to display their ads on high quality websites they know will stick around. I recommend waiting at least 1-2 months before applying to Google Adsense to improve your chances of being accepted. (But don’t worry, even if you get rejected, you can always reapply in the future). 3. You need traffic to make ads worth it. As of right now (April 2017), I have two ad networks set up on my site: Google Adsense & Gourmet Ads. Google Adsense has no pageview requirements, so you can host their advertisements even on a fledgling blog. Gourmet Ads “requires” 10,000 pageviews per month to be eligible, but they will often accept you if you’re only a few thousand shy of that. For some reference, it took me a good 10 months of blogging to hit the 10k mark, and my traffic varies widely between the 5k & 10k point each month, depending on how many articles or websites featured my recipes. So far, it seems like I’m on track to make around $100 per 10,000 pageviews, total, between the two ad networks. The lesson? Don’t even stress about ads until you start getting some decent traffic. You won’t be missing out on significant income if you only have 1k-3k views per month. Will ads make my website tacky? I know, I know, we all have images of dated websites packed with flashing ads and pop-ups burned into our psyche from the early 2000’s. Thankfully, those days have passed (for the most part). Now, ads are usually placed nicely in the side bar or header, anchored to the bottom of a page, or embedded between paragraphs of text. In fact, Google is now penalizing mobile websites with pop-ups, including lead magnets, in order to preserve the user experience. There are many ways to include ads on your site without sacrificing design or function. Don’t let fear of turning off your readers deter you! 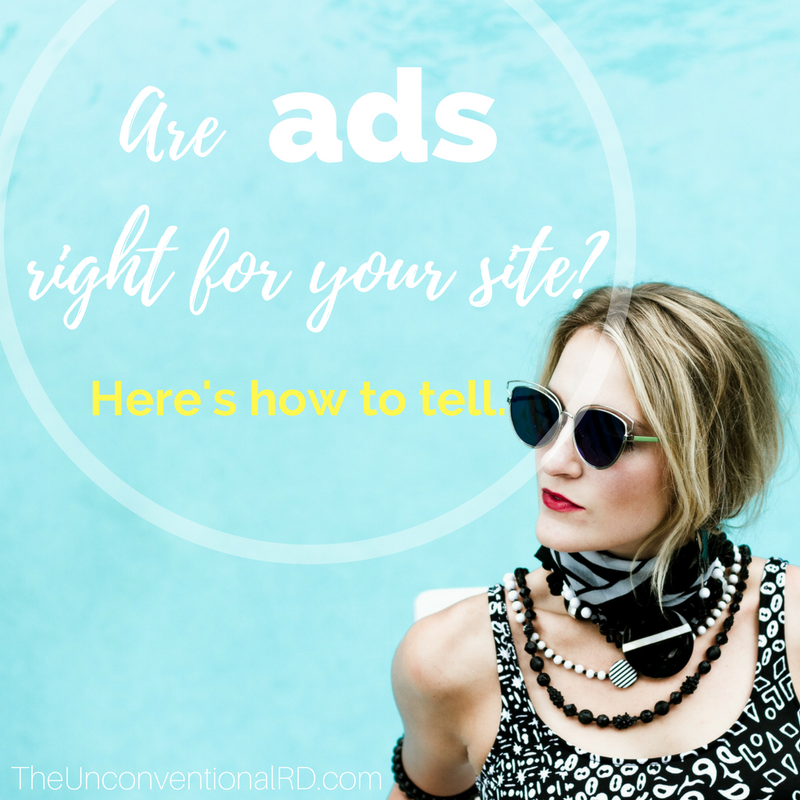 Ads are commonplace in the blogging world, and nothing to be ashamed of. 3. A combination of both. Next, think about your end goals. In the long run, do you want to generate income primarily from content on your website? Or is your dream to be fully booked with 1:1 clients? If you aspire to be first & foremost a content creator, then I would definitely encourage you to write, write, write, & then apply for ad networks for your site. (More on how to do this in future posts). If you envision yourself with a thriving private practice, then perhaps ads aren’t the best fit for you. Instead, focus on adding content to your site that would be valuable to your potential & current clients, strengthening your brand & messaging, and guiding readers towards booking appointments with you. Hi Erica, it’s Heidi:) Just want to say fantastic job hitting 1,000 subscribers! May I ask how you increase your blog traffic? I’ve been at it for a year, feel like I have good content, and yet only about 600 hits a month still. Any advice is greatly appreciated! Aww, thanks! I feel like it’s almost easier to get traffic when you’re posting recipes, because there are so many places to share! I would say that getting my content (recipes) featured in roundup posts on major websites always gives a huge boost in traffic that tends to linger over time. For articles, I actually get great traffic from Pinterest on the few RD-entrepreneur related articles I’ve posted. I think just sharing your links anywhere and everywhere you can (including sharing threads on Dietitians on the Blog FB group), and trying to get backlinks will eventually help your SEO & boost your rankings in search results. But this can take quite some time to kick in (like months or even years).